For several decades Peter Friend has been one of the leading figures in sedimentary geology and throughout that time he has helped scores of other people by supervising doctoral students, collaborating with colleagues, especially in developing countries, and selflessly sharing ideas with fellow geologists. This collection of papers is a survey of the research frontier in basin dynamics, a field Peter Friend helped initiate, and a token of thanks from people who have benefited from an association with Peter during their careers. 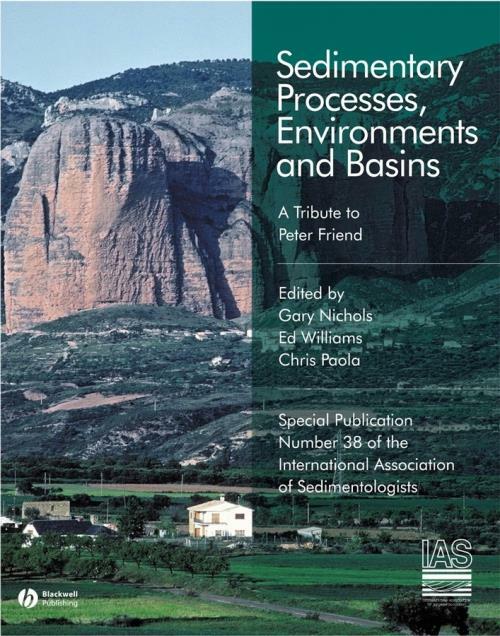 The papers in this book fall into four themes – Tectonics and sedimentation, Landscape evolution and provenance, Depositional systems and Fluvial sedimentation which reflect Peter s research interests and are all important areas of current research in sedimentary geology. There are both case studies and review articles on these themes which reflect recent work, but the collection can also be considered to be a sampler of sedimentary geology for anyone with broad interests in the Earth sciences. G. Nichols, E. Williams and C. Paola). Basin–fill incision, Rio Grande and Gulf of Corinth rifts: convergent response to climatic and tectonic drivers (M.R. Leeder and G.H. Mack). Drainage responses to oblique and lateral thrust ramps: a review (J. Vergés0. Stratigraphic architecture, sedimentology and structure of the Vouraikos Gilbert–type fan delta, Gulf of Corinth, Greece (M. Ford, E.A. Williams, F. Malartre and S.–M. Popescu). Anatomy of anticlines, piggy–back basins and growth strata: a case study from the Limón fold–and–thrust belt, Costa Rica (C. Brandes, A. Astorga, P. Blisniuk, R. Littke and J. Winsemann). Tectono–sedimentary phases of the latest Cretaceous and Cenozoic compressive evolution of the Algarve margin (southern Portugal) (F.C. Lopes and P.P. Cunha). Late Cenozoic basin opening in relation to major strike–slip faulting along the Porto Coimbra Tomar fault zone (northern Portugal) (A. Gomes, H.I. Chaminé, J. Teixeira, P.E. Fonseca, L.C. Gama Pereira, A. Pinto de Jesus, A. Pérez Albertí, M.A. Araújo, A. Coelho, A. Soares de Andrade and F.T. Rocha). Effects of transverse structural lineaments on the Neogene Quaternary basins of Tuscany (inner Northern Apennines, Italy) (V. Pascucci, I.P. Martini, M. Sagri and F. Sandrelli). Facies architecture and cyclicity of an Upper Carboniferous carbonate ramp developed in a Variscan piggy–back basin (Cantabrian Mountains, northwest Spain) (O. Merino–Tomé, J.R. Bahamonde, L.P. Fernández and J.R. Colmenero). Peritidal carbonate evaporite sedimentation coeval to normal fault segmentation during the Triassic Jurassic transition, Iberian Chain (M. Aurell, B. Bádenas, A.M. Casas and R. Salas). A shallow–basin model for 'saline giants' based on isostasy–driven subsidence (F.JG. Van Den Belt and P.L. De Boer). Single–crystal dating and the detrital record of orogenesis (D.W. Burbank, I.D. Brewer, E.R. Sobel and M.E. Bullen). Modelling and comparing the Caledonian and Permo–Triassic erosion surfaces with present–day topography across Highland Scotland: implications for landscape inheritance (D. MacDonald, B. Archer, S. Murray, K. Smith and A. Bates). 40Ar/39Ar dating of detrital white mica as a complementary tool for provenance analysis: a case study from the Cenozoic Qaidam Basin (China) (A.B. Rieser, F. Neubauer, Y. Liu, J. Genser, R. Handler, X.–H. Ge and G. Friedl). Provenance of Quaternary sands in the Algarve (Portugal) revealed by U Pb ages of detrital zircon (C. Veiga–Pires, D. Moura, B. Rodrigues, N. Machado, L. Campo and A. Simonetti). Anatomy of a fluvial lowstand wedge: the Avilé Member of the Agrio Formation (Hauterivian) in central Neuquén Basin (northwest Neuquén Province), Argentina (G.D. Veiga, L.A. Spalletti and S.S. Flint). Anatomy of a transgressive systems tract revealed by integrated sedimentological and palaeoecological study: the Barcellona Pozzo di Gotto Basin, northeastern Sicily, Italy (C. Messina, M.A. Rosso, F. Sciuto, I. Di Geronimo, W. Nemec, T. Di Dio, R. Di Geronimo, R. Maniscalco and R. Sanfilippo). Late Cretaceous to Early Eocene sedimentation in the Sinop Boyabat Basin, north–central Turkey: a deep–water turbiditic system evolving into littoral carbonate platform (B.L.S. Leren, N.E. Janbu, W. Nemec, E. Kirman and A. Ilgar). Facies anatomy of a sand–rich channelized turbiditic system: the Eocene Kusuri Formation in the Sinop Basin, north–central Turkey (N.E. Janbu, W. Nemec, E. Kirman and V. Özaksoy). River morphologies and palaeodrainages of western Africa (Sahara and Sahel) during humid climatic conditions (G.G. Ori, G. Diachille, G. Komatsu, L. Marinangeli and A. Pio Rossi). Floodplain sediments of the Tagus River, Portugal: assessing avulsion, channel migration and human impact (T.M. Azevêdo, A. Ramos Pereira, C. Ramos, E. Nunes, M.C. Freitas, C. Andrade and D.I. Pereira). Creation and preservation of channel–form sand bodies in an experimental alluvial system (B.A. Sheets, C. Paola and J.M. Kelberer). Fluvial systems in desiccating endorheic basins (G. Nichols). Anatomy and architecture of ephemeral, ribbonlike channel–fill deposits of the Caspe Formation (Upper Oligocene to Lower Miocene of the Ebro Basin, Spain) (J.L. Cuevas Martínez, P. Arbués Cazo, L. Cabrera Pérez and M. Marzo Carpio). Gary Nichols began his research career as a student of Peter Friend working on fluvial deposits in Spain, and has continued to work in clastic sedimentology in Europe, the Arctic and Antarctic, SE Asia and the Middle East. He teaches sedimentology and stratigraphy at Royal Holloway, University of London. Edward Williams conducted research at University College, Cork on Devonian Old Red Sandstone fluviatile rocks in SW Ireland, and has carried out further work on various continental facies and other rocks in the Spanish Pyrenees, western Alps and the Gulf of Corinth. He is currently Managing Editor of the journal 'Geostandards and Geoanalytical Research'..
Chris Paola is based at the University of Minnesota, USA, and does research in quantitative clastic sedimentology and stratigraphy, emphasising fluvial systems. His approach combines experimentation, theoretical analysis, and field work. Peter Friend served as External Examiner for his MSc thesis at the University of Reading.